John Curran and Maria Bergh stopped by on July 15 while on their way from Cleveland to Cincinnati. Lynne from our Medina store helped John pick out his Surly Long Haul Trucker, and he and Maria were using this ride as their first "shakedown" tour on their new bikes. Don and Sally Gordon started their trip in upstate New York. They joined the Underground Railroad Bicycle Route near Buffalo, and followed it to Louisville, KY. They stopped by the Peninsula store on July 16 to get some adjustments done to their brakes. This young man hails from Kyoto, Japan. His name is Nishiyama Ryuichi, and he stopped in on July 17 on his way from Los Angeles to New York City. Above are Ryan Herman, Will Moyer, Mack Lloyd, and Jake Loosararian. Their friend Jamie Schleicher (not pictured) is driving a support van for them. They began their trip in Seattle, and are on their way to New York City. They call themselves Team GCC (www.teamgcc.com), for their alma mater of Grove City College. 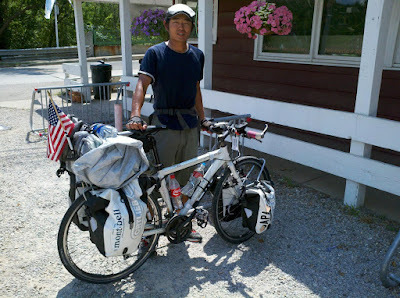 You can view more photos of touring cyclists that have stopped in all three of our stores in our Bicycle Touring Photo Gallery. 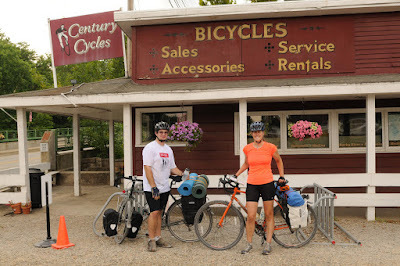 Many of the people riding through our area are using two routes created by the Adventure Cycling Association: the Northern Tier Route, and the Underground Railroad Route. The Adventure Cycling Association is now accepting nominations for the 2012 Bicycle Travel Awards, which include the Pacesetter Bicycle Travel Award, June Curry Trail Angel Award, Sam Braxton Bicycle Shop Award, and the Volunteer of the Year Award. If you know of any bicycle travel heroes that you'd like to nominate, click here.